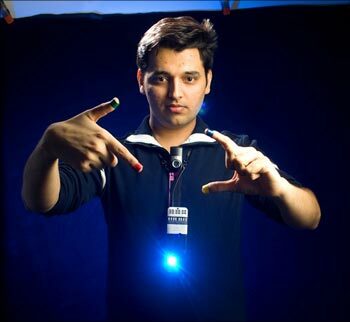 If Pranav Mistry has his way, people around the world can build their own wearable 'SixthSense' -- which uses a camera that understands human gestures -- at a cost of less than Rs 15,000 ($300) by obtaining the software he developed for free in the next few months. Mistry, a PhD student in Pattie Maes' Fluid Interfaces Group at MIT's Media Lab, is the genius behind SixthSense, a wearable device that enables new interactions between the real world and the world of data. "I notice that it's hard to for these kind of things to market in some sense. . . because I don't want this to comply with some of kind of corporate policy," he told PTI in Mysore on Friday on the sidelines of TED conference being held in India for the first time. "Rather than waiting for that time to come, I want people to make their own system. Why not?" "People will be able to make their own hardware. I will give them instructions how to make it. And also provide them key software...give them basic key software layers. . . they will be able to build their own applications. They will be able to modify base level and do anything". 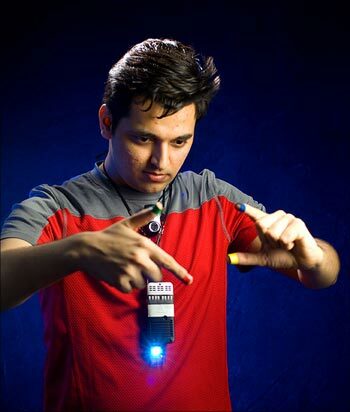 Image: Pranav Mistry is the genius behind SixthSense, a wearable device that enables new interactions between the real world and the world of data. SixthSense is going to be open source very soon, said Mistry, who is passionate about integrating the digital informational experience with real world interactions. TED (Technology, Entertainment, Design) is a small non-profit organisation devoted to ''ideas worth spreading.'' It started as a four-day conference in California 25 years ago. 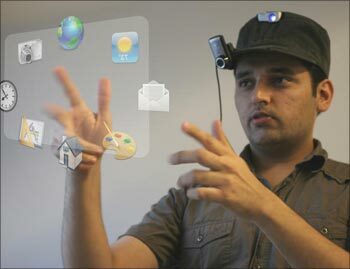 Explaining the concept, Mistry said: "SixthSense is an inexpensive wearable gestural interface that augments the physical world around us with digital information and lets us use natural hand gestures to interact with that information. "By using a camera and a tiny projector mounted in a pendant like wearable device, 'SixthSense' sees what you see and visually augments any surfaces or objects we are interacting with. It projects information onto surfaces, walls, and physical objects around us, and lets us interact with the projected information through natural hand gestures, arm movements, or our interaction with the object itself." 'SixthSense' attempts to free information from its confines by seamlessly integrating it with reality, and thus making the entire world your computer, he said. Image: SixthSense is going to be open source very soon, says Mistry. "I am working on that to make it open source", he said, adding, it would take 2-3 months for that to happen as "I have to do a lot of things before making it open source." On the estimated cost of the device, he said: "Cost will be mainly hardware because software. . . I am going to give it free. Hardware cost will be around $300 at minimum. This will go down for sure." SixthSense was voted the Invention of the Year by Popular Science magazine in the United States, and Mistry won one of Technology Review's TR35 Young Inventor Awards in August this year. Image: SixthSense was cobbled together with components that are off-the-shelf. Image: Using a camera that understands human gestures, SixthSense has extraordinary capabilities. "The digital world has power because it has dynamic information, but it's important that we stay human, instead of being another machine sitting in front of a machine," said Mistry who, before his studies at MIT, worked with Microsoft as a UX researcher. Some previous projects from Mistry's work at MIT include intelligent sticky notes, Quickies, that can be searched and can send reminders; a pen that draws in 3D; andTaPuMa, a tangible public map that can act as Google of physical world. 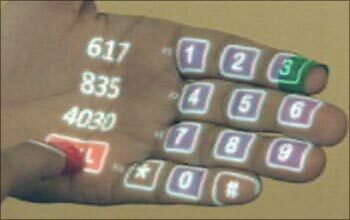 Image: SixthSense can just project a dailler on your palm and you can call a number by tapping on the keys on your hand!